Woman kills husband to collect $100k in insurance money, finds out his ex-wife was still the beneficiary - Ooooooo La La! The wife of a Cleveland firefighter was convicted Friday of soliciting his death to collect on insurance money. Uloma Curry-Walker was found guilty of aggravated murder, conspiracy, felonious assault and other charges in the Nov. 3, 2013 slaying of her then-husband of four months, William Walker. Curry-Walker now faces a maximum of life in prison without the possibility of parole. Common Pleas Judge Sherrie Miday set Curry-Walker's sentencing for Aug. 8. Prosecutors said Curry-Walker had run tens of thousands of dollars into debt through credit cards and loans, some of which she had taken out in Walker's name. As she sunk nearer and nearer to financial ruin, prosecutors said, she plotted Walker's death to collect on his $100,000 life insurance policy. Curry-Walker paid about a $1,000 down payment to her daughter's boyfriend, Chad Padgett, who went to his cousin, Chris Hein. After an initial failed attempt at Walker's life in October, Hein reached out to Ryan Dorty to carry out the killing. 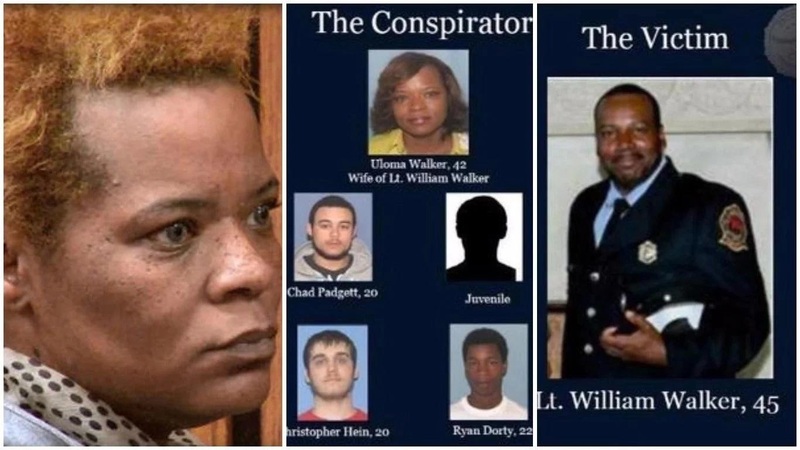 All four, including Curry-Walker's daughter, pleaded guilty, testified against her at trial and said the plot began with her. Curry-Walker sent her husband out to get food from McDonald's for her about 8:30, prosecutors said. Cellphone records show that she, her daughter and Hein placed several phone calls and text messages in the minutes leading up to the killing. Padgett and Dorty went with another man to the house and Dorty waited near the garage with a pistol that Hein had gotten. When Walker came back home, Dorty ambushed him and shot him four times as he was unlocking the side door near the driveway. Walker's keys were still in the door, prosecutors said. Curry-Walker told Padgett to have the shooter pull Walker's pocket out of his pants, to make the killing look like a botched robbery, the daughter testified. The daughter also said her mother told her that "no one would believe I would hire a bunch of kids to kill someone when I know people that could." What Curry-Walker didn't realize, Thomas said, was that Walker had not finalized switching his life insurance policy into her name from the name of his ex-wife, who actually got the payout in the months after Walker's death. Curry-Walker ended up having to give away most of their belongings and moved to North Carolina to stay with a relative. Friday would have been the couple’s fourth wedding anniversary.